It's preschool time! Our little angel is taking her first big steps into the world without mommy and daddy. She has met the teachers and the director. We have delivered our medical box, disaster pack and "safe" snacks. 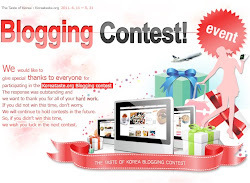 Now, it is time to pack our bucket! Many preschools do not allow children to bring backpacks to school and our preschool embraces the same policy. Backpacks are just too hard for little ones to dig through. So, our little one and all her classmates will be bringing buckets to school. What a wonderful solution! All those little fingers can quickly find exactly what they are looking for and the teachers can easily drop in those notes for mommy at the end of the day. Then, it is just a grab and go at the end of the day. Everyone can easily glance to see that the important things are there without any fuss. Although, preparing your bucket for the school year may take a little more creativity than a backpack, we had a great time getting ours ready. We used a marker to write our angels name on the bucket then let her stick her favorite stickers anywhere her heart desired. We gave her some "gems" with the sticky backs for bling and, "Voile!" a beautiful bucket! We probably had more fun preparing this bucket for school than we would have had packing a backpack! Here is our bucket list in case you would like to try this for your little angel. 8-14 quart bucket: Our school recommends a bucket that the kids can carry themselves. Although carrying your own bucket is a small task, it helps to encourage the "I can do it" attitude and fosters an amount of self confidence. 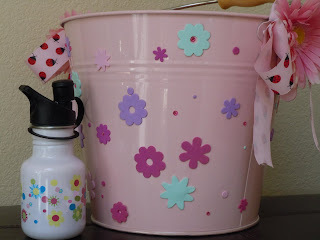 Stickers, bows, flowers, paint, markers: This is your little ones bucket. Provide whatever your little ones want and need to make this bucket "their own". If the children see the bucket as their own, they are also more likely to carry it! Water bottle: Most allergic kids should be cautious about drinking from water fountains, cups others have touched, or pitchers from unknown sources. I recommend that children with allergies bring their own water bottle. Be sure to put your child's name on the bottle and don't be afraid to let them decorate this either! A container for their daily snack from home: Regardless of the allergy, the safest way to feed your child is with a snack from home. Throughout the month, I will be posting a "Snack Match" blog that will highlight an allergy-free alternative to resemble a common children's snack. Again, be sure to label this container with your child's name and, if appropriate, let your angel decorate it. Utensil/napkin roll: This is to be included on an as needed basis. You can just roll up a plastic spoon in a napkin and secure it with a ribbon. Or, for those who like craft projects, you may sew a utensil/napkin roll (more on this in later blogs). Wipes: If they are not provided at your school, these are an essential. Sometimes it is difficult for teachers to wash children's hands as much as a child with multiple allergies might need. By keeping wipes in your child's bucket, you can teach them to wipe after play or before eating "all by themselves." This way, the child can learn this important skill and remember to ask a teacher to help with this task. Don't forget to label these so that they return to the bucket if they are ever removed. Change of clothes: Keep a clean set of clothes in a gallon-size zipper plastic bag. Label the bag and you might consider labeling the clothes. Many sewing machines come with this capability nowadays. If your child accidentally gets a dangerous food on their clothes, the teacher can change their clothes before a real emergency occurs. Safe sunscreen: We are all aware now of the dangers the sun can bring. Because of this, many preschools are willing to put sunscreen on your child. By providing sunscreen, you are encouraging this good habit and removing another worry about allergens your child might encounter. Be sure to label the sunscreen and fill out any necessary permission slips before leaving it at school. Hat: If you haven't already taught your child to wear a hat in the sun, this is a good time to develop that habit. While some preschools won't apply sunscreen, most will allow your child to get a hat from their bucket to wear outside. Be sure to label your child's hat in case it is forgotten somewhere.